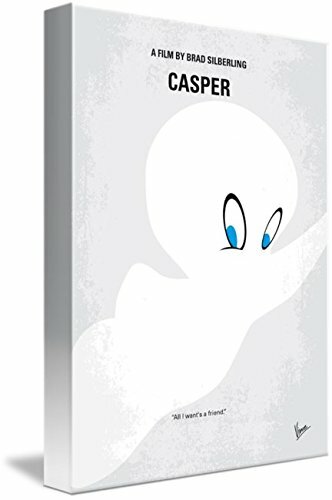 Gallery-Wrapped Canvas entitled 'No752 My CASPER minimal movie poster'. A paranormal expert and his daughter bunk in an abandoned house populated by three mischievous ghosts and one friendly one. Director: Brad Silberling Stars: Bill Pullman, Christina Ricci, Cathy Moriarty . Multiple sizes available. Primary colors within this image include: beautiful tones sure to enhance your space. Made in the USA. Satisfaction guaranteed. Inks used are latex-based and designed to last. Canvas is acid-free and 20 millimeters thick. Canvas is designed to prevent fading.